The FEA DUAL ENGINE COMPRESSOR LIMITER is designed with both audiophile and studio quality features that many musicians will appreciate. 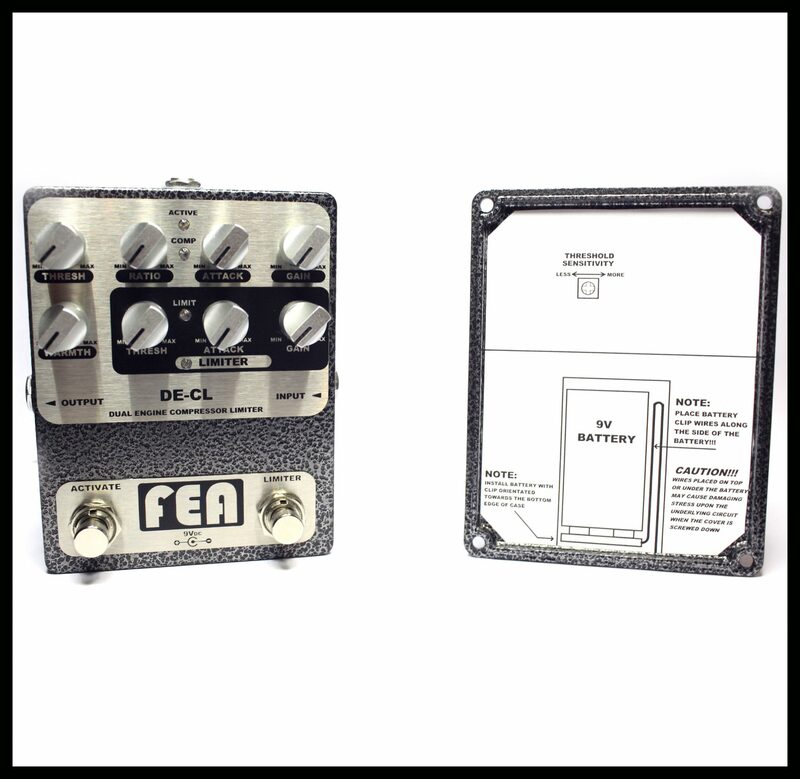 The FEA DE-CL utilizes two sidechain control engines for audio signal dynamics control. The compressor sidechain is based off of the FEA Opti-FET compressor sidechain for its smooth compression qualities. The DE-CL’s limiter sidechain is optimized specifically for high performance limiter operation. The limiter has an adjustable attack so that it can also be used as a very high ratio compressor if desired. Both the limiter and compressor control a single optical gain cell in the audio path for parallel processing of the audio signal dynamics. This compressor and limiter configuration allows for multi-slope compression that is found in some high-end rack units. This is the first FEA compressor/limiter that utilizes adaptive release circuitry. Adaptive release is sometimes referred to as “program dependent release” by other compressor manufacturers. Adaptive release is designed to behave more like the dynamic response of our human hearing. If the instrument signal triggers the threshold in short bursts then the release will be fairly quick. If the threshold is continually activated over a period of several seconds, then the release will be slower. This adaptive release sounds very natural and balanced. The DE-CL utilizes audiophile grade Burr-Brown SoundPlus™ operational amplifiers for audio signal amplification. The Burr-Brown™ amplifiers were specifically chosen for their outstanding audio performance. The output amplifier circuit also contains a warmth control. The warmth circuit is designed to integrate amplifier characteristics and harmonics that have a warming tonal presence. With the warmth control set to minimum, the output amplifier operates in a clear, linear fashion for very low distortion. As the warmth control is increased, the output amplifier is made to operate in an increasing asymmetrical mode along with transient nonlinearities. The range of the warmth circuit is very large and can create tonal warming harmonics far beyond typical warm sounding amplifiers. The Silonex AOI’s (analog optical isolators) used in the FEA DE-CL utilize a combination formula for the photocell to overcome limitations found in other traditional optical components affecting reaction and recovery times. This fast current monitored Silonex AOI allows the sidechain in the compressor and limiter to accurately control the dynamics of the compression. The purely resistive photo element in the AOI exhibits less noise and distortion than most designs using a VCA (voltage controlled amplifier). A good number of audiophiles advocate that only high-quality passive components should be in the audio signal path and this is one application that I would have to agree with them. The dual rail power supply in the DE-CL is built on its own discrete circuit board to physically separate it from the audio circuits. The power supply is over filtered two times to assure exceptionally clean power for the audio signal circuitry. This power supply provides 18Volts (+9V and -9V) to the compressor circuit board to provide plenty of headroom for the signal. 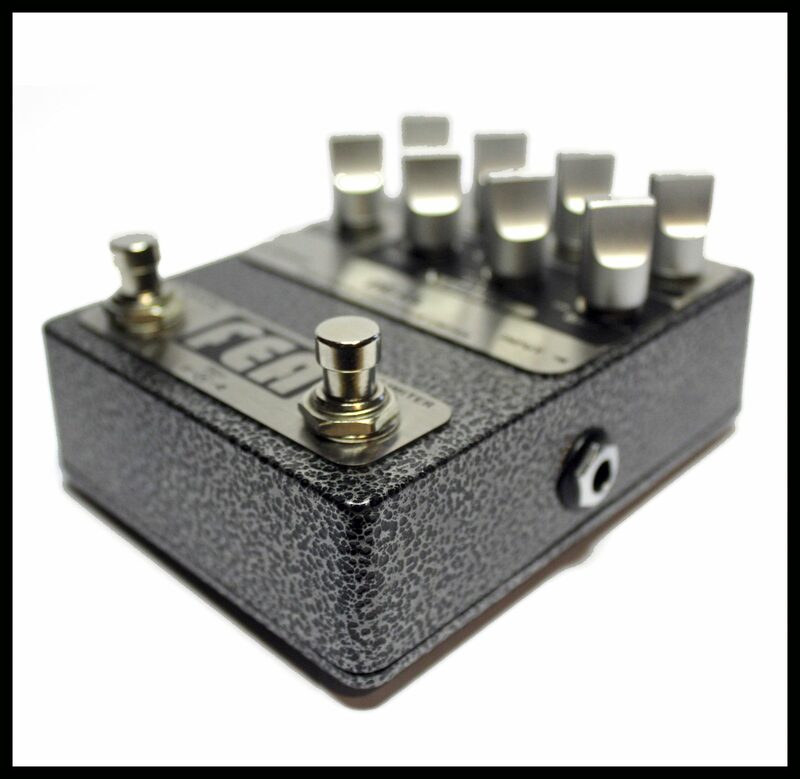 The power supply was designed to provide separate power for all of the sidechain control circuitry. This assures that any natural electrical noise that the compressor sidechain control circuitry generates will not bleed into the audio signal circuitry. I have not seen this approach to power distribution in any of the other manufacturer’s guitar effects. Is it overkill? Maybe…but I feel that it is absolutely crucial to eliminate every bit of noise where possible. THRESHOLD, RATIO, ATTACK and GAIN controls for the compressor and THERSHOLD, ATTACK and GAIN controls for the limiter. 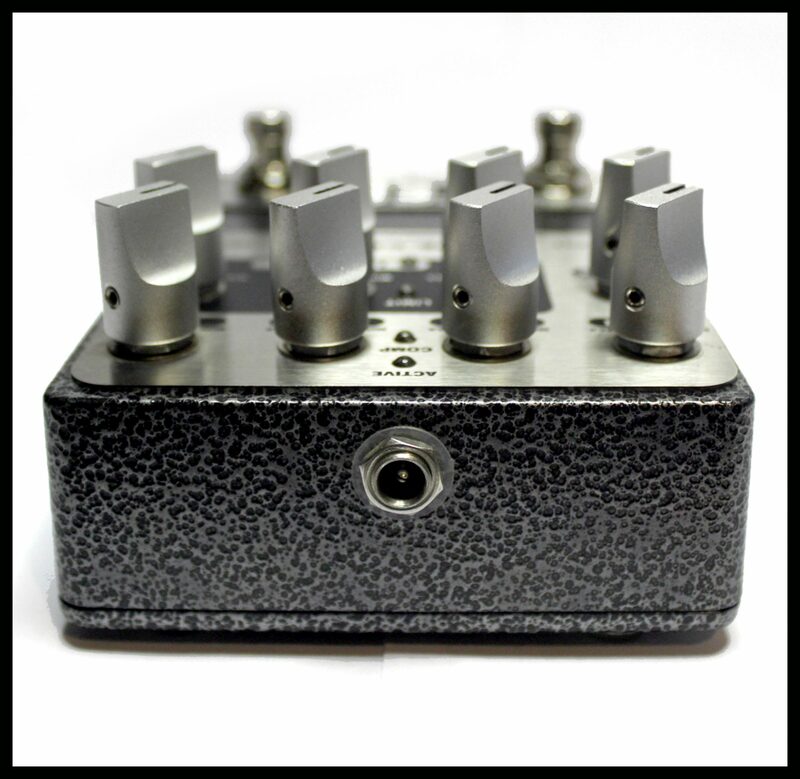 The control ranges for the ATTACK have been optimized for their function and for use on both bass and guitar. The compressor exhibits soft-knee compression at lower RATIO settings and hard-knee at maximum RATIO settings. The limiter exhibits hard-knee limiting at all times. The COMP and LIMIT LED’s indicate when the THRESHOLD has been reached. These LED’s do not indicate the RELEASE response. The compressor sidechain utilizes precision full-wave rectification of the audio signal for the THRESHOLD circuits for accurate envelope tracking. This also reduces the possibility of “pumping” with very low frequencies. The compressor and limiter utilize adaptive release circuitry for a natural response. 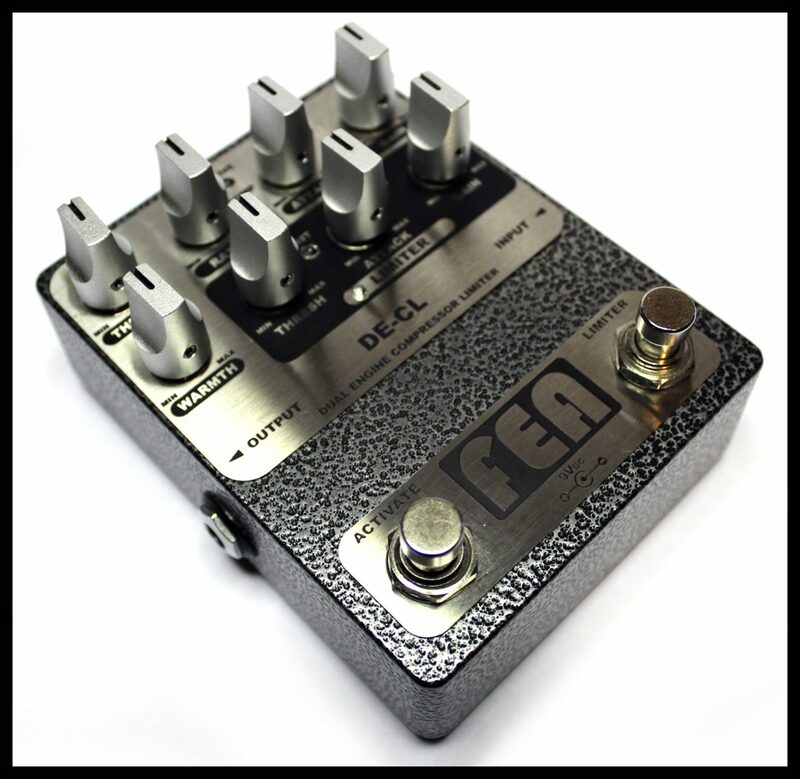 ACTIVATE footswitch places the compressor/limiter in the signal chain or in Direct Bypass mode. In Direct Bypass mode the signal at the input is directly connected to the output and does not pass through any electronics. LIMITER footswitch enables the limiter function. The limiter operates in parallel with the compressor for signal dynamics control. NOTE: When the limiter is active the compressors gain control is deactivated and the limiters gain control sets the output level. WARMTH control modifies the function of the output amplifier from operating in a clean, linear mode to a harmonically enriched warm mode. The signal compression and limiting is accomplished with only a resistive component (Light Dependent Resistor or Photocell). All resistors in the circuit are low noise 1% metal film type. The signal coupling capacitors are tight tolerance, quiet, multi-layer and metallized polyester film type. Optical switching for the gain controls for quiet switching when the limiter is activated and deactivated. 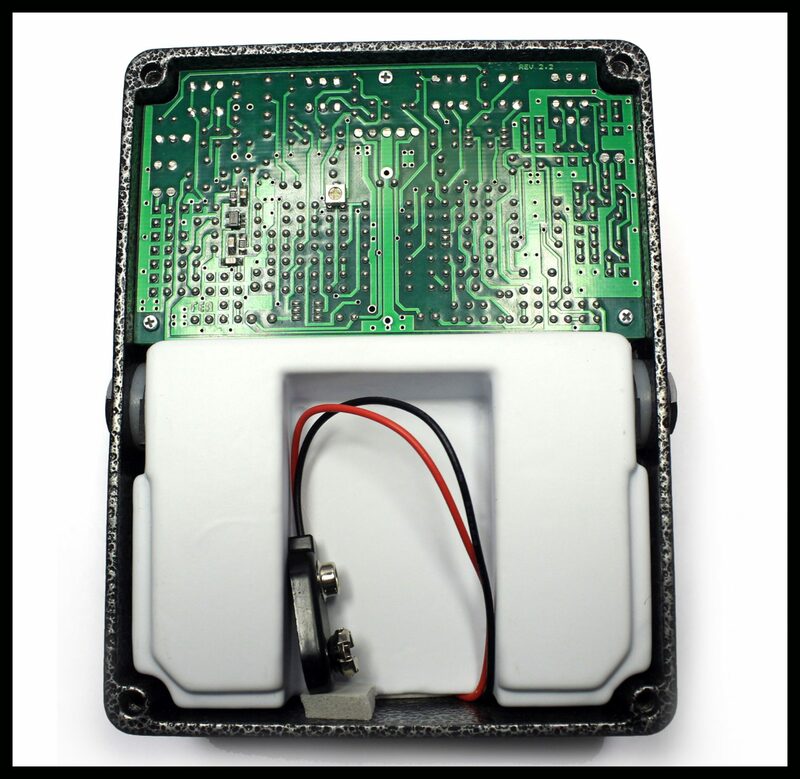 The power supplies onboard voltage charge pump allows the circuitry to operate at 18volts (+9 and –9 volt rails) from a single 9-volt battery or DC power adapter. This allows the signal plenty of headroom from active electronic guitars and aggressive playing techniques (i.e. pop and slap). The “switch on” power supply current is less than 1µA (micro amp) on the signal ground at the INPUT jack. This is approximately 45,000 times (-93dB) less than the commonly used method of connecting the battery’s negative terminal to ground via the sleeve of the plug inserted into the INPUT jack. The “switch on” sensing method used in the FEA Dual Engine Compressor Limiter keeps nearly all of the circuit’s generated white noise and transient currents out of the INPUT stage signal ground. Extreme measures have been taken to keep the power and signal paths as clean as possible. NOTE: Unplug the cord from the INPUT jack when not in use to prolong battery life. The power and grounds for the signal path circuitry are isolated from the sidechain power and grounds to protect the audio signal from spurious noise. The power for the signal amplifiers is exceptionally clean, filtered twice for each rail and all filter stages are oversized.